* 1st background is always random. * 2 sounds – car starting (optionmenu), and car driving away (system_ok). * Custom home row icons by me. All other icons taken from GlowBall’s Ferrari Dynamic Glideshow and recolored by me. 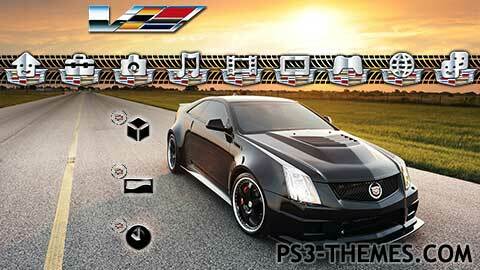 This theme was posted by PS3 Themes on September 19, 2014 at 1:11 pm, and is filed under Cars/Transportation, Slideshow Themes.You can leave a response or trackback from your own site. super duper dope my man!!! Gotta say a big thank you, again, for this beauty of a theme. Those new gen logos are perfect and what to say about them engine sounds, you got me grunting like Tim the toolman taylor haha. I could go on for lines and lines but it all comes down to the fact you got everything on point!! Can u make a badass theme of Chicago Bulls bro please ima big fan of them. @ The Cult Of Personality – No Transformers. Just Cadillacs, lol. optimus we might have a problem, call in bubble bee! I did this as a request. Matt5star sent the pics and gave me the direction for the icons. Faxtron, mr_foxx, or F-Rott usually do the preview vids for me. I figured out how to fake it on my own, but with zoom it’s a hassle. Plus I’m putting the finishing touches on the Most Powerful Theme In The Universe. Come on now Ultra I know you wish you could be like Ludacris for a day driving that bad boy around making this amazing theme but how about a preview video of the theme like you always do?